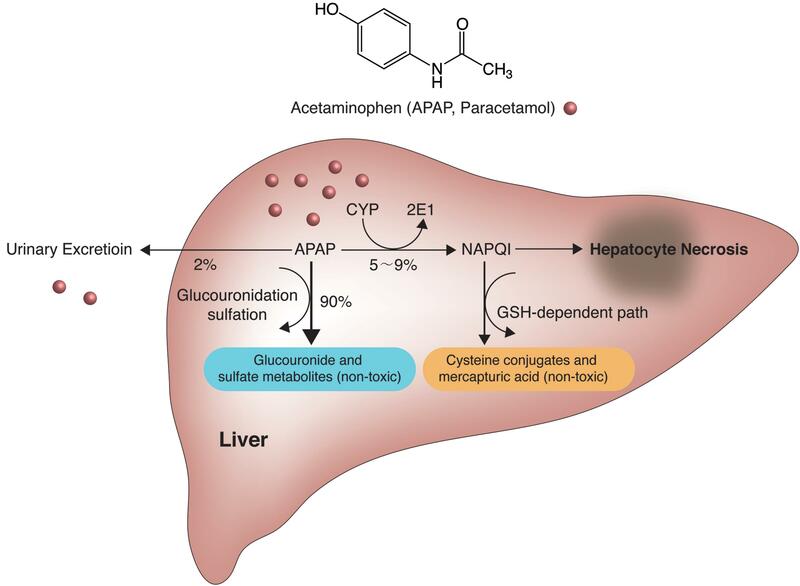 Hepatic injury and subsequent hepatic failure due to both intentional and non-intentional overdose of acetaminophen (APAP) has affected patients for decades, and involves the cornerstone metabolic pathways which take place in the microsomes within hepatocytes. APAP hepatotoxicity remains a global issue; in the United States, in particular, it accounts for more than 50% of overdose-related acute liver failure and approximately 20% of the liver transplant cases. The pathophysiology, disease course and management of acute liver failure secondary to APAP toxicity remain to be precisely elucidated, and adverse patient outcomes with increased morbidity and mortality continue to occur. Although APAP hepatotoxicity follows a predictable timeline of hepatic failure, its clinical presentation might vary. N-acetylcysteine (NAC) therapy is considered as the mainstay therapy, but liver transplantation might represent a life-saving procedure for selected patients. Future research focus in this field may benefit from shifting towards obtaining antidotal knowledge at the molecular level, with focus on the underlying molecular signaling pathways. Reported cases of APAP-induced hepatotoxicity first emerged in the United States in the mid-1980s, and since then all signs point towards a growing incidence. It has been reported that this is one of the most common pharmaceutical products to cause DILI.1–5 Mortality rates have been approximated at 0.4% in overdose patients, translating to 300 deaths annually in the United States.1 Although toxic ingestions causing hepatic failure are usually in excess of 150 mg/kg, an increasing number of reports has arisen to suggest that lower doses of APAP may confer acute liver injury and liver failure.1–4 A so-called “therapeutic misadventure” phenomenon, as coined by Zimmerman et al., is becoming increasingly acknowledged, as some patients have presented with acute liver failure despite consumption of “safe” doses of APAP. Some of these patients may have some specific risk factors, such as nuances in APAP metabolism at the mitochondrial and molecular level, which are currently under investigation in hopes of further elucidating their contributions to this life-threatening condition. With the advent of APAP/opioid combination analgesics and the ever-growing number of prescription narcotics being prescribed by medical practitioners, a larger number of patients have been placed in harm’s way as they are at significant risk of APAP hepatotoxicity. Less than a decade ago, in 2010, over 130 million prescriptions for APAP/hydrocodone were filled in the United States.3 Reportedly, 63% of unintentional overdoses of APAP occur with use of the opioid/APAP combination, with an additional 17% of adults suffering liver injury.5,6 Fortunately, the United States FDA has recognized the dangers of the prescription combination of APAP and narcotic analgesics and, in January 14, 2014, implemented a fixed amount of APAP approved per dosage unit of combination analgesics tablets in effective practice. Epidemiologic studies have demonstrated that at least 6% of filled prescriptions for either acetaminophen alone or acetaminophen in combination with opioids exceeded 4000 mg per day of acetaminophen, which is a cause for real concern.3,5,6 Further epidemiologic studies have demonstrated that there is a true lack of knowledge regarding the harmful potential of APAP. It is not uncommon for patients to confuse non-steroidal anti-inflammatory (NSAIDs) medications, such as naproxen or ibuprofen, with APAP. While providing health literacy education to teach distinguishment of APAP and NSAIDs is important, some have thought it possibly more beneficial to mitigate the chance of inappropriate APAP over-ingestion by reducing the pack size of APAP preparations sold, which they believe may reduce the incidence and severity of APAP hepatotoxicity.7 What is clear is that APAP overdose and hepatotoxicity is a preventable public health concern that deserves awareness by both clinicians and the patient population alike. Fig. 1. Acetaminophen (APAP) metabolic pathway. APAP-induced cell death of hepatocytes takes on the characteristic changes of necrosis. The hepatotoxicity of APAP rests predominantly with the highly toxic and reactive compound NAPQI, which forms covalent bonds with sulfhydryl groups on cysteine and lysine molecules within the mitochondria of hepatocytes and which spontaneously reacts with GSH and binds to hepatic proteins.8,11 The protein adducts formed, specifically those of mitochondrial protein adducts, lead to oxidative injury and hepatocellular necrosis. An approximately 70% reduction of GSH has been proposed as the threshold for protein adduct binding to occur; however, this theory has been called into question as APAP-protein adducts have been detected at 1 hour after APAP treatment, a time that that would precede GSH depletion.8 It is important to note, however, that a clear inverse relationship has been demonstrated between GSH concentration and APAP metabolic activation activity.8 Findings from current studies of APAP hepatotoxicity seem to favor the mechanism of toxic injury being related to mitochondrial and endoplasmic reticula leading to hepatocyte injury and necrosis. Abbreviations: APAP, acetaminophen; EtOH, ethyl alcohol. Zimmerman’s “therapeutic misadventure” describes acute liver injury following APAP consumption and failure of APAP therapy, when used at or below the daily maximum recommended dose of 4000 mg. However, there are many other patients who intentionally over-ingest APAP (with clear evidence from careful history taking and measured APAP levels), or the more indolent and accidental over-ingestion of doses over 4000 mg per day (not as obvious when eliciting the patient history), which we would like to term “therapeutic misfortune.” The United States FDA clearly states “severe liver damage may occur if you take more than 4000 mg of acetaminophen in 24 hours.”31 In these extreme circumstances, prompt medical assessment and therapeutic intervention is necessary to administer therapy that will allow for salvage of a damaged and/or failing liver. One study reported that ingestion of the recommended maximum amount of 4000 mg of APAP for 2 weeks resulted in the asymptomatic elevation of alanine transaminase, up to three times normal, in 40% of patients.19 These transaminase elevations did not amount to any clinical significance, and after the APAP was discontinued the transaminase levels returned to normal.19 Yet, while asymptomatic, chronically elevated aminotransferases may be of concern to healthcare providers, leading to further costly diagnostic studies or changes/restrictions in necessary medications. Chronic alcohol ingestion, however, augments APAP hepatotoxicity by up-regulating, enhancing and increasing the synthesis and activity of CYP 2E1 and decreasing GSH stores and synthesis, thus enhancing liver necrosis and worsening prognosis.5,8,21 Chronic alcoholism and APAP overdose may potentiate liver failure, but there is no indication that the combination of alcoholism and taking therapeutic amounts of APAP will necessarily cause hepatotoxicity.21 Therefore, one has to be wary of characterizing all alcoholics as being at higher risk of APAP hepatotoxicity. Regular ethanol consumption of greater than 250 mg/dL appears to be the threshold for enhancement of CYP 2E1 enzymatic activity; this condition represents individuals who drink 18 or more standard alcoholic drinks.21 A more reasonable explanation of why chronic alcohol abusers have higher APAP-related hepatotoxicity is a tendency among these individuals to delay seeking medical attention after APAP ingestion, which would prolong their “time to NAC”—the only demonstrated treatment available for salvage of a hepatotoxic liver. The data suggests that chronic alcohol consumers who experience “therapeutic misadventure” are at increased risk of APAP hepatotoxicity.20–24 It appears that a single dose of APAP, at 325 mg to 500 mg for as-needed analgesic or anti-pyretic purposes, will not lead to acute APAP hepatotoxicity in an alcoholic patient, especially if APAP is taken less than 8 hours from alcohol consumption. APAP is often prescribed, and can be prescribed, to patients who require an anti-pyretic or analgesic despite recent history of alcohol ingestion. APAP, an analgesic utilized by patients from infancy into the geriatric years, shows age-related hepatotoxic tendencies. In general, younger patients are better able to overcome acute liver failure as a result of APAP hepatotoxicity, probably due to the larger hepatic cell mass that is present in this population before the cell damage occurs, as well as the better capacity of those cells for non-toxic metabolism and their improved capacity for regeneration.20 Patients over 40 years old who overdose on APAP portend a higher risk of acute liver failure, liver transplantation and death.5 In general, APAP metabolism appears age-dependent, with elderly patients being at higher risk of hepatotoxicity after acute overdose of APAP than the pediatric population.42 Considering the current widespread use of APAP alone and in opiate combinations among adults of advanced age (to treat cancer pain or chronic musculoskeletal pains), one must not forget to monitor patients for complications of long-term and high-dose APAP use. Various genetic polymorphisms in CYP enzymes and their levels of activity may explain why APAP is metabolized with excessive or diminished oxidative capabilities.26,43,44 The enzymes UGT (glucouronidation), SULT, CYP 450, GST, N-deacetylase (deacetylation), NAT2 (deacetylation), and fatty acid amide hydrolase are involved in APAP metabolism and have been shown to be related to both hepatic and nephrotoxic effects of the analgesic medication.45 It appears that genotypic changes of these enzymes leads to potentially different risk/benefit ratios when APAP is ingested. Comparative studies of Caucasian and African populations showed that more mercapturic acid and cysteine conjugate metabolites were recovered in the former (at nearly a 2:1 ratio), indicating that increased hepatic metabolism occurs in that group.43 Another study, which compared Caucasian and Chinese populations indicated the increased susceptibility of the former to APAP hepatotoxicity reflects the lower CYP 2E1 and 2D6 activity in the latter.45 Thus, although no specific limitations on APAP intake have been proposed based on ethnic background, further studies on this topic may yield useful clinical information about the safety profile amongst a diverse patient population. Identification of APAP overdose is critical, as significant morbidity and mortality may be prevented with early therapy. Many patients have only minimal and non-specific symptoms that are comparable to viral prodrome; these symptoms include malaise, nausea with or without vomiting, and abdominal pains. There are four established sequential stages of APAP hepatotoxicity, which should be considered upon presentation to clinic. It is vital, however, to keep in mind that while each stage is designated by a general time range following the APAP over-ingestion, clinical symptoms and laboratory results are dependent on the formulation (combined opiate-APAP preparations, extended-release, etc.) or doses of APAP ingested, including co-ingestions (i.e. chronic or acute alcohol ingestion, herbal supplements, or prescription drugs, as previously discussed), and the existence of preceding liver disease. Stage I occurs within the first 24 hours of ingestion and is characterized by the non-specific symptoms of nausea, vomiting, malaise, lethargy and diaphoresis. Aspartate transaminase (AST) and ALT values are usually normal, although in immense overdose, elevated values can be detected in as little as 8–12 hours. Stage III occurs within 72 to 96 hours after the initial APAP overdose, and is noted by the return of stage I symptoms along with marked AST and ALT elevations (possibly > 3000 IU/L) in conjunction with jaundice, encephalopathy, coagulopathy and lactic acidosis. Maximal liver injury occurs in this stage. Renal failure, and on rare occasions pancreatitis, can occur as a complication.49 This stage has the highest risk of mortality, which is most frequently due to multi-organ failure. Lactic acidosis portends a poor prognosis (by King’s College Hospital (KCH) criteria), and the mechanism of lactic acidemia is two-fold: NAPQI being present in excess and causing mitochondrial dysregulation, followed in subsequent hours by tissue hypoxia and decreased hepatic metabolism and clearance of lactate, leading to a “two-hit” effect on worsening of the lactic acidosis condition.12,13 Certain objective data, such as a prothrombin time peaking at > 180 seconds, along with prothrombin time that continues to rise beyond 4 seconds after the APAP overdose, confers about a 90% mortality without liver transplantation.50 If a patient becomes obtunded and comatose as a result of the APAP overdose, intubation with mechanical ventilation becomes necessary. Poor prognostic signs include multi-organ failure, which may involve cerebral edema, renal failure, profound hypoglycemia and lactic acidosis, any signs of which should prompt an immediate liver transplant evaluation.4,6,8,50,52,53 In clinical practice, signs of unintentional toxic ingestion typically present later, when the above-mentioned complications are already apparent and have progressed. Indeed, further studies to elucidate the prevalence of APAP-related hepatotoxic patients may be beneficial to identify the clinical stage of APAP hepatotoxicity in order to better triage patient treatment, improve disposition, and design the best follow-up. APAP hepatotoxicity is one of few bona fide causes of liver injury that can raise serum aminotransferases > 10,000 IU/L. The most worrisome time for maximal organ damage occurs between 3 and 5 days following the acute ingestion, straddling stage III and stage IV hepatotoxicity; thus, prompt recognition of APAP toxic ingestion with expedient initiation of therapeutic intervention becomes important to prevent acute liver failure. Patient history and physical examination are paramount, especially in delineating the time course and formulation of APAP ingested. APAP level measurements are commonly performed when a patient initially presents in the acute care setting with a toxic ingestion of unknown substance, altered mental status and/or suspicion of intent of self-harm. It is critical to obtain a 4-hour APAP level, or as close to a 4-hour level as possible, as this value guides therapy and impacts patient outcome. Upon presentation, additional laboratory studies are necessary to obtain other important clinical parameters, including arterial blood gas (to investigate acid/base status), coagulation profile, basic metabolic panel, hepatic function tests, and urine drug screen (to determine possible co-ingestions).54 A negative APAP reading should not be interpreted as APAP-related hepatic injury having not taken place, as levels may be undetectable while liver damage has already occurred. However, clinicians should be cautious in interpreting APAP levels in patients with direct hyperbilirubinemia > 10 mg/dL, as a falsely elevated APAP concentration can be the result of bilirubin’s interaction with the enzymatic measurement of APAP.55 This clinical context becomes especially important because DILI can manifest significant hyperbilirubinemia. Patients with unintentional APAP overdoses have usually ingested APAP often over many days as an analgesic or anti-pyretic therapy. Symptoms of hepatotoxicity may have already begun by presentation. Jaundice, right-upper quadrant pain, nausea, vomiting, hepatomegaly and encephalopathy indicate high levels of APAP ingestion, and thus when these symptoms are observed the patient’s APAP level should be checked.27 The Rumack-Matthew nomogram that was previously described is not applicable in this case, and instead treatment with NAC would be appropriate for a finding of APAP levels > 20 μg/mL, with or without ALT elevation.56,60 NAC should also be administered when a patient has excessive APAP intake with elevated ALT levels, even though serum APAP levels are undetectable. NAC does not appear to be of benefit when APAP levels are undetectable, patients are asymptomatic, or ALT level is normal. Similar to any solid tumor transplant candidate, candidates for transplant treatment for APAP hepatotoxicity should undergo a thorough psychiatric evaluation and assessment to determine the level of social support needed. This type of evaluation becomes especially important in cases for which the APAP-associated liver failure was a consequence of intentional ingestion, as a repeat episode of over-ingestion will inevitably cause harm to the transplanted organ and squandering of a limited resource. APAP protein adducts that form upon NAPQI conjugation with protein sulfhydryl groups of cysteine in GSH or cellular proteins readily interact with mitochondria. These mitochondrial protein adducts are thought to cause mitochondrial dysfunction and to promote oxidant stress.17 Indeed, high levels of protein adducts have been detected in the serum of patients with APAP overdose.17 Detection of elevated levels of these APAP-protein adducts by high-pressure liquid chromatography (HPLC) can be used for clinical indication of APAP hepatotoxicity. However, such testing remains a specialized method, available to certain institutions, and thus has not spread to all health centers that handle cases of APAP hepatotoxicity. For HPLC interpretation of suspected APAP hepatotoxicity cases, liver centers will have to look to hire expert technicians who can provide these services in an emergency setting. Serum markers of mitochondrial damage and death, including glutamate dehydrogenase (GDH), nuclear DNA (nDNA) and mtDNA have been investigated as clinically useful surrogate markers capable of indicating mitochondrial lysis following hepatocyte necrosis in APAP hepatotoxicity.12,64–68 There is evidence that patients who were non-survivors of APAP-induced acute liver failure had a statistically significant increase in GDH, nDNA, and mtDNA fragment levels, as compared to patients that recovered and survived their acute liver failure, inferring that more significant mitochondrial damage portends a higher mortality rate.65 The highest activity of GDH in plasma has been found in patients with markedly elevated ALT levels emanating from zone 3 of the liver, where GDH is most highly expressed and where APAP is known to case the greatest extent of liver injury.12 Moreover, the time course of the release of GDH and mtDNA has been shown to correspond well to the release of ALT from hepatocytes undergoing necrosis. The association between a rise in levels of bile acids and those of ALT (indicating hepatocyte injury) was investigated as another biomarker that might be potentially useful for predicting prognosis of APAP hepatotoxicity. The process of bile acid transport from hepatocytes into the biliary tract via canalicular transporters is sensitive to disturbances, as evidenced by elevated bilirubin levels that occur upon minor liver injury. A research group found that one specific bile acid, glycodeoxycholic acid (GDCA), rose significantly higher in the group of non-surviving APAP-associated liver failure patients than in the group of patients who survived their liver failure despite having similar ALT levels as the first group.64 Due to the increased efficiency in medical diagnostics afforded by HPLC and mass spectroscopy techniques, prognostic-related findings of bile acid level may add to the armamentarium of findings from studies on how to better predict patient morbidity and mortality, and perhaps can even be used to shift treatment decision-making on surgical transplantation versus medical therapy for APAP overdose. On the molecular level, human microRNAs (miRNA) have also been identified as potential early biomarkers for indicating APAP-induced hepatotoxicity at a stage before alanine aminotransferases become elevated. One miRNA in particular, the miRNA-122, was shown in a cohort who had taken APAP to significantly increase before ALT levels rose.67 This finding was reaffirmed in another study that demonstrated a corresponding increase of serum miRNA-122 and miRNA-375, along with an increase in APAP protein adducts, all of which were also seen prior to ALT elevation.68 Urinary miRNA-375 was also detected at high levels in that study.68 Furthermore, that study had also enrolled children who had presented to the hospital with accidental APAP overdose, and thus applicability to the adult population may be better reserved for a time after other studies are completed with a greater adult population. One research group has sought to capture one aspect of the wide systemic effects of APAP hepatotoxicity by focusing in on kidney failure following acute APAP ingestion. Specifically, expression of the kidney injury molecule-1 (KIM-1) was quantified, and it was found that patients who died from APAP-associated acute liver failure or who required liver transplant had significantly higher KIM-1 values on day 1 of presentation, as compared to those who spontaneously survived.69 Elevations of a kidney injury marker should not come as a surprise, however, as acute kidney injury evaluation in the form of serum creatinine is included in scoring systems such as the APACHE II and KCH criteria. KIM-1 measurements appear to outperform traditional serum creatinine as a measure of acute organ damage, and this possibility deserves further research attention. Detection of biomarkers is certain to gain more clinical significance in the future management of APAP hepatotoxicity in the modern era of outcome-based medical care. Collective qualitative or quantitative results of these biomarkers may serve to predict potential morbidity and/or mortality of liver disease and failure, leading to appropriate triage of patients into those requiring emergency liver transplantation versus patients who are likely to have good clinical improvement with NAC therapy alone. More validated studies need to be done to make this correlation apparent. NAC is a cysteine prodrug and hepatic GSH precursor, and should be administered immediately as an antidote in patients with established APAP hepatotoxicity or those with high risk of developing this condition. NAC replenishes and maintains hepatic GSH stores by providing cysteine, the substrate which detoxifies reactive metabolites of APAP.23,24,56,75 In addition, it may reduce NAPQI back to APAP by enhancing the sulfonation pathway of APAP metabolism.56,75 Administering NAC to patients with APAP overdose may reduce mortality from 5% to 0.7% of patients, and thus timely administration is critical.71Table 2 lists commonly accepted indications for treatment with NAC in the setting of acute over-ingestion. Abbreviations: APAP, acetaminophen; ALT, alanine aminotransferase; AST, aspartate aminotransferase; INR, international normalized ratio; NAC, N-acetylcysteine. The standard formulations for NAC are as follows. For the IV regimen, a loading dose of 150 mg/kg in 200 cc is given for 15 minutes, followed by 50 mg/kg in 500 cc over 4 hours and then 100 mg/kg in 1000 cc over 16 hours.4,54,56,71 For the PO regimen, a loading dose of 140 mg/kg is given, followed by 70 mg/kg every 4 hours for a total of 18 total doses.54,56,71 Renal or hepatic dose adjustment is unnecessary. Patients at high risk of hepatotoxicity should have serial APAP level and hepatic function panels measured before the completion of NAC. NAC should be continued if APAP levels remain > 10 μg/mL or ALT is persistently elevated, with re-evaluation of the status after 12 hours.54,56 NAC therapy can be considered complete if APAP levels are undetectable and ALT level has returned to normal.56 However, if the patient continues to present evidence of liver dysfunction beyond persistent ALT elevation (satisfying KCH criteria of acidosis, elevated creatinine, hyperbilirubiniemia, coagulopathy and encephalopathy), then NAC therapy should be continued as these indicators portend a poor prognosis regardless of transaminase levels.62 Patients with severe hepatotoxicity or acute liver failure should continue on NAC at 6.25 mg/kg/h until a liver transplant takes place or liver dysfunction is reversed (evidenced by regression of AST or ALT, resolved encephalopathy, and/or INR > 1.5) with an undetectable APAP level.54,56Table 3 describes how NAC therapy functions to mitigate hepatocyte necrosis and to promote liver regeneration. Abbreviations: JNK, c-Jun-N-terminal kinase; GD, glutamate dehydrogenase; GSH, glutathione; NAC, N-acetylcysteine; HO-1, heme oxygenase-1; NAPQI, N-acetyl-para-benzo-quinone imine; Nrf2, nuclear factor erythroid 2-related factor 2. While there are two treatment options, the clinical scenario should determine the route of NAC administration (PO versus IV). The efficacy between the two preparations appears the same, although no head-to-head trial currently exists. IV NAC is preferentially given to patients with acute liver failure and to those who refuse or have a contraindication for the PO formulation; contraindications include coma, pancreatitis, ileus or gastrointestinal tract insufficiency. IV NAC has a 10–20% risk of anaphylactic reaction, and transfusion should not be halted for minor reactions of flushing.60,72 Other identified side-effects of NAC include nausea, vomiting, diarrhea or constipation, and rarely fever, headache, drowsiness or hypotension. Steroids, diphenhydramine and bronchodilators can help resolve the anaphylactoid reactions and should be given so that NAC therapy can be continued under close monitoring.72 The oral formulation has a sulfur component, and thus has an unpleasant taste and smell that can cause nausea and vomiting; switching PO to IV therapy is an option. This switch can be mitigated, however, by using a nasogastric tube for direct gastrointestinal access or by taking the medication with sodas or juice to make the medication more tolerable. Liver transplantation can be a lifesaving procedure when APAP ingestion has progressed to irreversible liver failure. Prognostic factors including MELD, KCH criteria and APACHE II scores have all been investigated as objective indicators to select liver transplantation candidates.51,52,62 Qualifying for liver transplantation not only requires a projected poor outcome and high risk of mortality based on these scoring systems but also necessitates a multidisciplinary approach that includes psychiatric evaluation, which may be challenging for patients who have intentionally overdosed on APAP. In one study, 20% of the center’s liver transplantation cases were due to APAP overdose, which was the most common cause of acute liver failure prompting transplantation; however, only 12% of those patients presenting to this same center with acute liver failure from APAP overdose actually received a transplant.51 In a large multicenter study of liver failure cases from the United States’ Acute Liver Failure Study Group, 54% of patients had APAP-related liver failure and were compared to non-APAP related liver failure patients; the APAP-associated liver failure cases fared better in 2-year survivorship if they were not transplanted, as compared to transplanted patients.73 Conservative medical therapy has a good outcome when prognostic scoring systems point against proceeding with transplant, and it appears that physicians are making better-informed decisions in regards to transplantation of patients who present with acute liver failure related to APAP hepatotoxicity. Another group in China has suggested an association between adequate hepatocellular serotonin levels in murine models and protection against hepatocyte inflammation, oxidative stress, GSH depletion, peroxynitrite formation, elevated hepatocyte proliferation and reduction in several enzymes described in the process of hepatocyte necrosis.76 Human hepatocyte models are a next logical step, and thus more investigations need to be carried out before either serotonin or SFN can be realistically considered on the therapeutic level. APAP ingestion and subsequent hepatotoxicity is a critical problem that continues to plague individuals across the world, due to the cheap cost of APAP contributing to its being a ubiquitous analgesic and anti-pyretic drug available through consumer pharmacies and as prescription-only medication formulations. Since APAP is responsible for nearly half of the cases of acute liver failure in the United States and remains the leading cause for liver transplantation, continued awareness, education and research should be undertaken.78 Perhaps due to the attention paid to APAP-induced acute liver failure, survival rates of ∼60% are touted as decent when compared to DILI from other substances.77 New research in detecting biomarkers of injured and necrotic hepatocytes seems promising, especially since it has become increasingly important to identify APAP-induced acute liver injury patients earlier in order to provide lifesaving medical and surgical therapies. While much is currently known about APAP hepatotoxicity regarding its epidemiology, risk factors, pharmacology and toxicology, diagnostics and treatment modalities, there remains a plethora of scientific questions that should be answered in order to improve the understanding of molecular and sub-molecular relationships and pathways that may offer new therapeutics to tackle this curable yet potentially devastating event. Contributed to the manuscript by drafting the document, formatting the figures and tables, obtaining permission for use of previously published figures, and performing final editing of the content (EY), contributed to the manuscript by writing content and formatting the tables in the manuscript (AB), contributed to the manuscript by drafting sections of the document (MC), contributed to the manuscript by providing editing comments (MK), contributed to the manuscript by providing critical revision and administration during the manuscript writing (NP). Copyright © 2016 The Second Affiliated Hospital of Chongqing Medical University. Published by XIA & HE Publishing Inc. All rights reserved. This is an Open Access article distributed under the terms of the Creative Commons Attribution-Noncommercial 4.0 License (CC BY-NC 4.0), permitting all non-commercial use, distribution, and reproduction in any medium, provided the original work is properly cited.